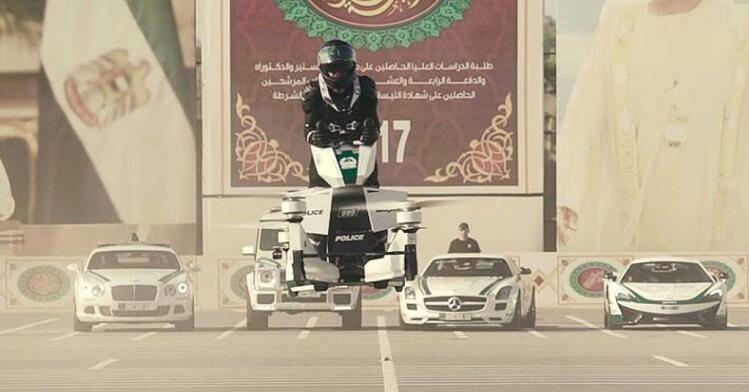 Dubai's police force has added to its flamboyant law enforcement vehicle fleet - which already boasts a Lamborghini and Ferrari - with the Surf3 hoverbike. General director of Dubai Police’s artificial intelligence department, Brigadier Khalid Nasser Alrazooqi, has confirmed that training on the hoverbikes is already underway. “Currently we have two crews already training (to pilot the hoverbike) and we’re increasing the number." The S3 2019 Hoverbike model has vertical take-off and landing abilities and fits within a standard car parking space. The use applications may initially be limited by the vehicle's max speed of 96 km/h and a max flight time of 25 minutes with a pilot, and 40 minutes when in drone mode. The vehicles are produced by Hoversurf, a Russian-owned company based in California. Hoversurf has gifted Dubai’s police its first serial production of the electric vertical take-off and landing (eVTOL) vehicle after a deal was signed last year. The company’s chief operating officer, Joseph Segura-Conn, said the bikes cost US$150,000 ($A206,000) hoverbikes and the Dubai force could be supplied with as many as they want. “They’re going to let us know in the next month or two if they’d like any more ... If they would like 30 or 40, we’ll make it happen for them,” Mr Segura-Conn said. Dubai Police have also announced plans for Future Societies 5.0, a summit of AI-led policing to be held at the Dubai World Trade Centre on April 22-23, 2019. The announcement of the event follows this year’s formation of the Dubai Police Strategic Plan (2018-2021) in which the force created a new General Department of Artificial Intelligence.